Observation - Japanese Rose - UK and Ireland. Description: an introduced ornamental species that often becomes naturalised by the coast. I noticed it in the hedgerow because of the enormous rosehips. an introduced ornamental species that often becomes naturalised by the coast. 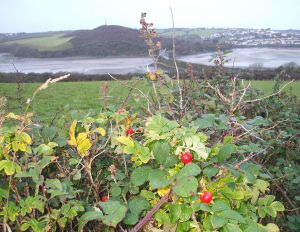 I noticed it in the hedgerow because of the enormous rosehips.